We all know that Christmas can be an overwhelming time of year, from preparing feasts for large parties to remembering to take the food out of the oven before it burns or just choosing the perfect gift to give your loved ones on that magical day. Lets face it, despite the good intent, gift shopping is just plain hard! 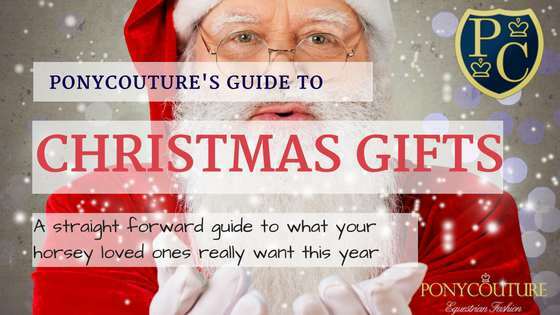 Choosing the perfect gift can be stressful, you want something that will be used but not so practical that they'd buy it for themselves in an everyday shopping trip (that's right, back away from the underwear and put the jumper down!). Where do you start? Do you go for something ornamental that will almost never come in use for anything? Or do you go for a more useful item that would be appreciated but just luxurious enough that it's still gift worthy? If clothing what size do you choose? What style do they like? If you're choosing something electronic, would they get the use out of it that a tech enthusiast would? Or would it be sat on a shelf to gather dust? Phew! Now that's an awful lot to think about. Now picture all of that but your gift recipient in question is an equestrian, that is a whole new game entirely! Gift giving from one horsey person to another is usually not so complicated, sure we think "How about something I always need, a new wheel barrow perhaps?" - "Maybe a shavings fork?" - Both useful gifts admittedly, but not exactly something to cause Christmas glee! Feeling dizzied yet? Fear not fare readers as I may have a solution just for you! CK Equine create beautiful, quality English leather bridles, breastplates, belts and more. They keep up with current trends with a choice of patent leather, rolled leather and smooth leather and supply comfort fit headpieces, padded, crank nosebands, grackle nosebands, drop nosebands, flat hunt bridles, double bridles and more! Visit the CK Equine Facebook Page for details on how to order. 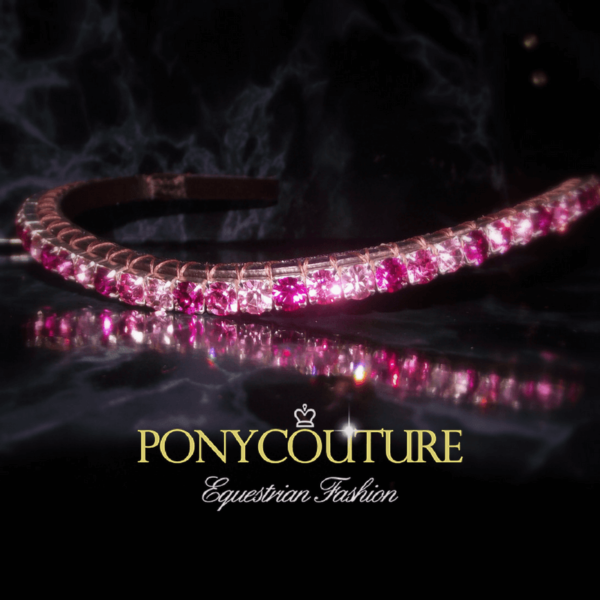 Of course we may be biased but here at PonyCouture we tend to think, what better a gift for any self respecting Equestrian than a handmade, Luxury Crystal browband from PonyCouture? 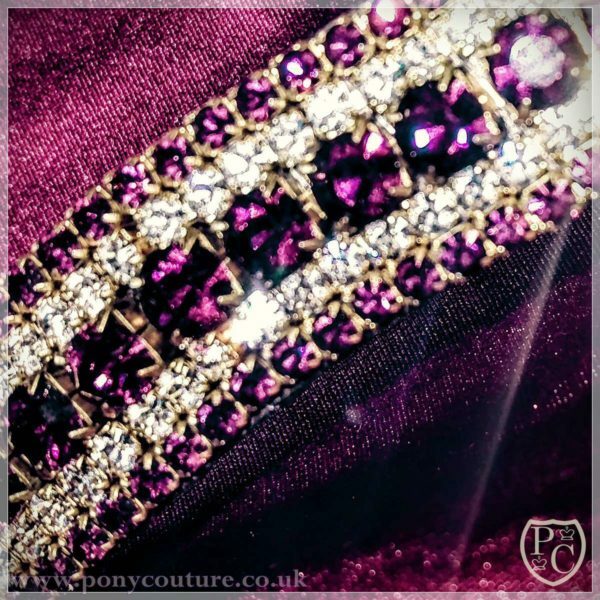 - Why a bespoke luxury Crystal browband from PonyCouture of course! 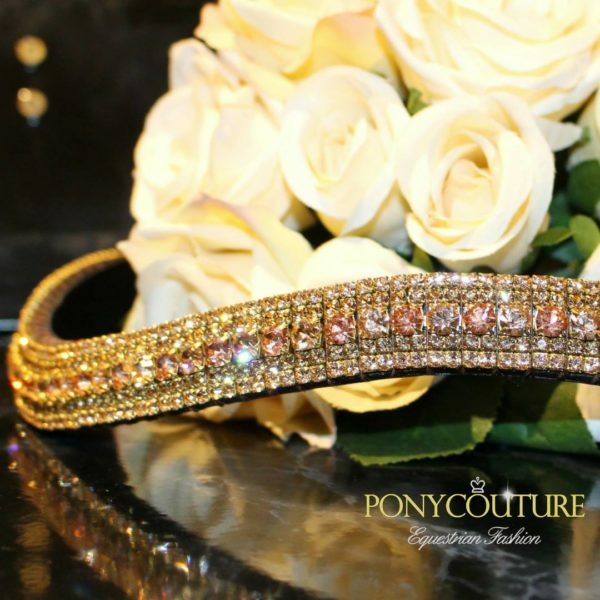 PonyCouture Crystal browbands come in three widths and many sizes! 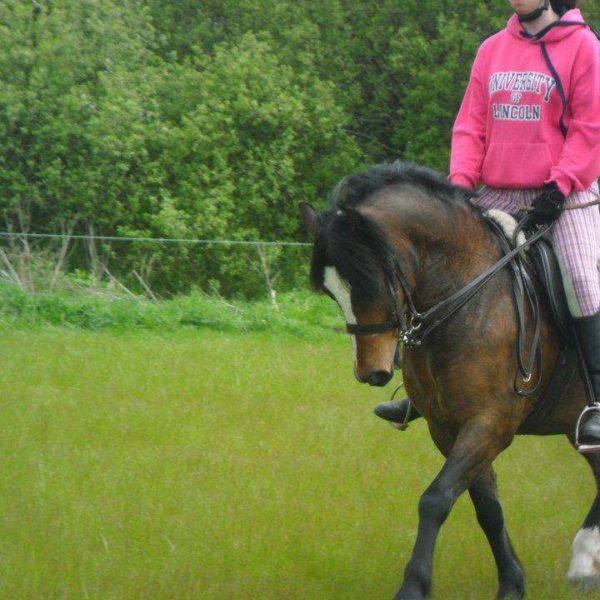 From the smallest of ponies to the largest of horses we have a size for you! With our fully bespoke services you can also select a number of colour combinations and we even give you the ability to choose between shiny silver-plated settings or classy antique-look brass. 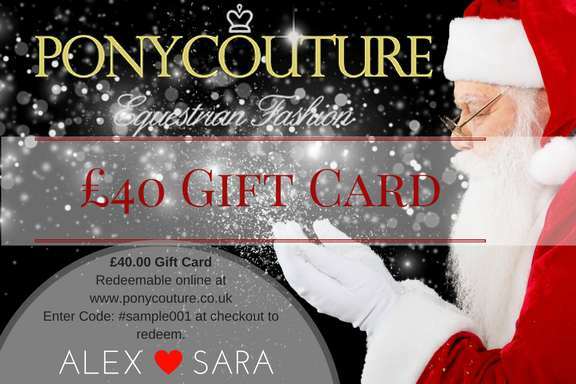 Don't forget that we also sell Gift Cards so if you're stuck with what size or style to order for your loved one this Christmas then why not just pop a Gift card under the tree or in their stocking? - Perfect! What do horse owners love more in the world than their horse? Our bet is not much! So perhaps a thoughtful gift for them would be a photos hoot for their horses from a skilled Equestrian photographer? What better way for them to have a treasure to keep forever of their beloved four legged companions than a framed photo above their fireplace? Two of our favorite photographers are Emma Nunns Photography who took the very beautiful photo of our cover girl Galaxy (pictured above) and Victoria Gray Photography who is responsible for some stunning pieces photography art! Victoria Gray Photography have special festive offers on and aslo sell Christmas gift cards! Perfect for popping in the stockings this year. Click Here for more or click here for her facebook page. Cosy Tweed Earwarmers will add a touch of Country class to your loved ones wardrobe this Christmas. Hilstonia Equestrian & Country Wear is a small business producing showing wear, showing accessories and tweed products along with unique gifts and accessories. "All products in produce can be ordered through the face book page, they can be paid for via PayPal goods and services and posted via royal mail signed for service, or cash on collection at my workshop at Winterton shopping village (will add the link, there's a few other businesses up here with gifts perfect for Christmas)." Earwarmers and Scarf sets can be purchased by clicking this link to their facebook page. Slip one of these cheeky calendars into any horse woman's stocking to bring a smile to her face and help a good cause whilst at it! Hot bods and horses, what more could you want for Christmas?! Hunks & Horses are a popular Equestrian Charity as each year they produce these much sought after calendars to raise money for Testicular Cancer Research UK and World Horse Welfare! To top it off there is currently a festive offer on the calendars that cost just £6.00 "Buy 2 get 1 FREE!" "Hunks & Horses charity calendars are filled with, well, hunks and beautiful horses! All proceeds from every calendar, and associated events, are donated equally between World Horse Welfare and Testicular Cancer Research UK. " Learn more about Hunks & Horses Calendars, their goals, what else they do and where to purchase by visiting their website here . Looking for something unique with that truly personal touch? Trudi Taylor creates just what you are looking for with her line of horse hare jewelry and keepsakes from your own horses hair. "Prices are braided bracelets £20-£35 sterling silver items brackets rings earrings pendants are £45-£69 with hair or ashes." For purchases and more info visit Horse Hair Keepsakes website or their Facebook page by clicking here. Tack cleaning in the buff! If there's one thing little girls love nearly as much as ponies - it's to look like a princess with stunning, glitter hair bows and accessories. These pony and unicorn themed handmade hair bows from Olivia Rose Bowtique combine both a girls love for ponies, colour, glitter and accessories! With many designs from ponies to foxes and unicorns there is something to suit every little girls tastes! "I create handmade hair accessories with love, laughter & sparkle for both you and your little people ♥ I am based in Scotter, Lincolnshire"
For more info and how to purchase please visit their facebook page or website . I know it that our crystal browbands have been mentioned once or twice on this website but this one really is perfect for little girls! 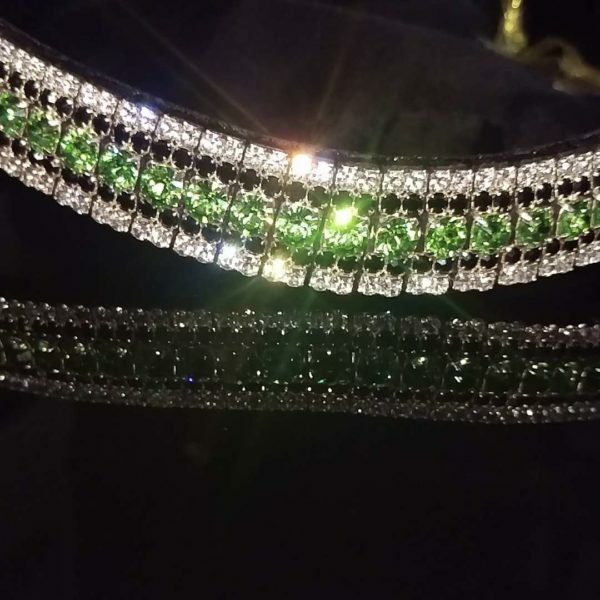 with a center of gradient pink shades and accented in iridescent AB Preciosa crystals before being edged in sparkling clear crystals this browband was just made for a little girls dream tack room! Although our Pink Ombre bling browbands aren't just for little girls, they're for grown ups too! Don't be afraid to sport pink! However if pink isn't your colour, we also make Ombre browbands in blues, purples, greys, reds, greens, oranges and so on! The possibilities are near endless. Ok, so this might be one for the mums and other grown ups out there too but we're pretty certain a lot of horse mad kids would be extatic to find a miniature Valegro under the Christmas tree this year! Breyer horses make many stunning model horses and children's toys in several sizes like this one from Farm Toys Online although some are larger than the pocket size models, they are all equally lovely and would be at home in any play room! Visit Farm Toys Online by clicking here to purchase this model. Breyer horses can be found at a number of UK stores including Argos so don't forget to keep your eye out when browsing online! We Equestrians tend to spend more time with straw in our hair than accessories, but this is more of an undesirable side effect of our passion than a look we aim to achieve every morning when we go to muck out. Which is why every now and again it is nice to be treated to a something really luxurious like a pamper day or in this instance hair extensions! It is often hard to maintain luscious locks with the elements of weather and hat hair continuously hammering on our strands, so clip in hair extensions from Rock Locks hair extensions are perfect, just clip in when you're going out and style, and remove at the end of the night ready for a day at the yard. Rock Locks also sell bonded, tape and micro loop hair extensions as well as clip ins and weaves so you can buy them for a steal of a price for quality hair extensions and get them fitted for that extra glam gift! It is a known fact that us horsey folk spend more time with dirt under out nails that polish on them, so why not treat your horse loved one to some beauty therapy this Christmas? With professional free lance beauty therapists like 'Pure Beauty by Hannah' loved ones can experience all the treatments of the beauty salon from the comfort of their own home! Pure Beauty offers everything from nail extensions to massages so there is something for everyone's tastes! All within the comfort of your own home! I cover the North Lincolnshire/South Yorkshire areas. " Click here to view Pure Beauty by Hannah's work and to make a booking! Air Brush makeup is on the list!